Food conservation -- North Carolina. Food substitutes -- North Carolina. World War, 1914-1918 -- Food supply -- North Carolina. World War, 1914-1918 -- Economic aspects -- United States. World War, 1914-1918 -- Women -- North Carolina. 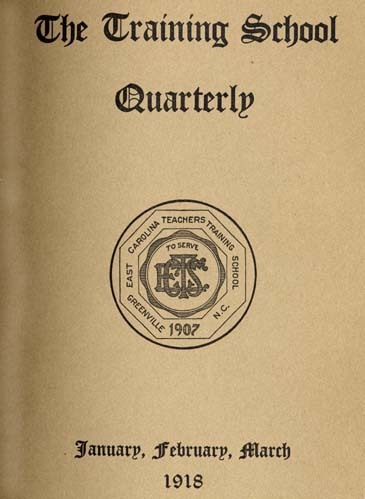 East Carolina Teachers Training School. I BEGAN my efforts to keep down the waste as soon as I came to the Training School, two years before war was declared. I had been here only a few weeks when I asked all of the seniors who presided at the tables to come to my office and talk over the question of waste. I asked them to help me, assuring them that if they saved on bread, meat, etc., I could give them ice cream and other dainties so dear to their palates. This helped some, but it has taken grim, cruel, relentless war to bring them to real saving. The students' coöperation during the past few months has been both wonderful and beautiful. I started in the dining-room to preach the "Gospel of the clean plate," until now the girls take great pride in showing a clean plate after the meal is over. Next, I learned to a cupful how many beans, peas, meat and bread would go around, and everything is measured. If any food is left from one meal we try to fix it in a palatable form for the next meal, to avoid carrying over waste food. Waste in the kitchen is carefully guarded; servants are required to take on their plates only what they can eat, and woe betide the one who is caught with a plate partly filled with food in the act of scraping it out. The garbage can requires the closest attention, and is inspected daily. Nothing goes into it except eggshells, potato skins, bones--after being boiled to extract every particle of flavor--coffee grounds, tea leaves, orange skins, except what I need to conserve for seasoning, and the roots and outside leaves of cabbage and collards. Clippings from a newspaper, "Garbage Pail--Put In "Garbage Pail--Keep Out," have been posted on the wall of the kitchen and all the servants, kitchen and dining-room help asked to read these and follow these instructions as far as possible. This plan worked admirably, with the result that the waste from a meal will scarcely fill a quart cup. When I came to the Training School I found a large cask of black cooking molasses. Since sugar has been so scarce, I boil the peelings and cores of apples, which were formerly used for making a heavy thick jelly, add to this a very little sugar, and make a fruit syrup which I put in this cask of cooking molasses to improve its flavor, and, like the "widow's cruse of oil," it never gives out. We save every piece of bread and make crumbs to be used on top of baked dishes and to roll fish in before baking or frying. Every ounce of fat is saved, rendered, and mixed with other lard, and used as shortening for biscuit, thereby saving many a tub of lard. After boiling the bony pieces of meat, from which we make stews, and baked dishes, we take the stock and with the addition of a few vegetables make the soup which forms the main dish for our Monday's lunch. Speaking of the garbage can, when I went to look over its contents a few days ago I found about a dozen nice looking baked apples. Upon inquiring, one of the servants told me that one of the "young ladies" had slipped up on her high heels and lost her apples as she was carrying them to her tables. I hated very much to lose the apples, but as no harm was done to the "young lady," I readily forgave the loss of the fruit. But any loss is rare. Bake in a greased mold for two hours. In my early days of housekeeping I did not think a breakfast could be served without meat, but now we all eat and enjoy our meatless breakfasts. When we serve meat or gravy, we do not serve butter. Cutting down the per capita amount of flour, fats, and sugar were the problems that all had to solve, and the director of supplies worked constantly on this. When the general call was made for the cutting down of the amount of white flour, the buyer bought graham flour, an increased amount of oatmeal, grits, and hominy. Graham flour biscuit have been on the table once a day since September. Cornbread without eggs is served once every day; and sliced Graham loaf makes the third meal. On Sunday morning the hearts of the girls have always been gladdened by the sight of "Sally Lunn" muffins. When eggs were scarce and high we had to disappoint them, and when I crossed the campus I was greeted with, "Oh! Mrs. Jeter, when are we to have some more muffins?" At last a crate of eggs came, and I was afraid to use them as freely as formerly, and, calling my ally, the bread cook, we made the same quantity of bread, using exactly half of the eggs formerly used, and everybody was pleased and no one knew the difference. In the fall when the Food Administrator called upon the people to cut the amount of white flour from five pounds per week for one person to four pounds, the school was serving a fraction over two and a half pounds. We are using far less than that now. Fresh pork has been almost cut out. Last year we served bacon about three times a week. This year it is a treat about once a week--two-thirds cut. Last year we had ham once every week. We now serve it about once in two weeks. An increased amount of cereal might seem to mean an increased use of sugar, but raisins and dried figs served with the cereal takes the place of sugar. Some skeptical person might ask if the girls are getting enough to eat. I defy any school to show a healthier, handsomer, or better fed crowd of girls. The amount of beef used has been cut down perhaps to one-fourth of the former amount. This is no longer the foundation of the fare. With all of these changes in our manner of living, I am pleased to say that I have not heard a complaint, from president's office to kitchen help. The housewife must learn to plan economical and properly balanced meals which, while properly nourishing her family, do not encourage overeating or waste. It is her duty to use all effective methods to protect food from spoilage by dirt, heat, mice, or insects. She must acquire the culinary ability to utilize all left-over food and turn it into palatable dishes for her family. If only one ounce of food a day goes to waste we will in one year lose 1,300,000 pounds of food. This is a war that will be won by the women of our land. The kitchen is a place of infinite possibilities, a laboratory of interesting experiments, an altar upon which the sacred fires burn. The domain of the housewife has been raised from obscurity and hard labor to a position requiring brains to conceive and system to operate. Domestic Economy takes its place beside Political Economy, and "woman's sphere" stretches from Dan to Beersheba, and from the hearthstone to the Capitol. It may surprise the readers of Mother's Magazine to learn that a great bulk of the poultry and eggs consumed each year by our teeming millions of people is the product of poultry flocks managed by women, says Charles L. Opperman in the March Mother's Magazine. This condition, however, can be more readily understood when we come to realize that from eighty to ninety per cent of these products come from the general farms of our different States, and that the manager of the farm flock is the woman in the home. Upon her falls the task of renewing the flock and looking after the breeding, feeding, housing, and general care of the birds. How well she has accomplished her task is strikingly shown in the tremendous growth of the industry during the past few decades. Today we speak of it as our billion-dollar industry, a splendid tribute to the skill and perseverance of our farm women. One may truthfully say that woman is the master poultry-keeper of America. While it is true that the woman on the general farm has played a big part in the progress of the poultry industry, we cannot overlook the fact that an almost equally important role has been carried out by her sister home builder in our countless suburban towns and villages. The majority of the latter class are producers in the sense that they produce sufficient eggs and poultry to supply the family needs, but it is not unusual for such flocks to return a tidy profit to their owners at the end of the year from the sale of surplus eggs and poultry. In fact, only last year, I ran across a suburban flock of one hundred and fifty birds that made their owner a profit of over three hundred dollars for the year.